It’s a no-brainer that breakfast and coffee are quite complementary to one another. 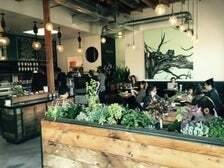 Yet serious coffee houses that serve breakfast are much rarer than you might expect. Either you’ve got a coffee hotspot or an all-out breakfast place, but what if you want eggs with your Third Wave coffee? Kitchen space can be very hard to finagle. Fortunately, there are specialty coffee shops that serve breakfast dishes beyond the usual pastries. 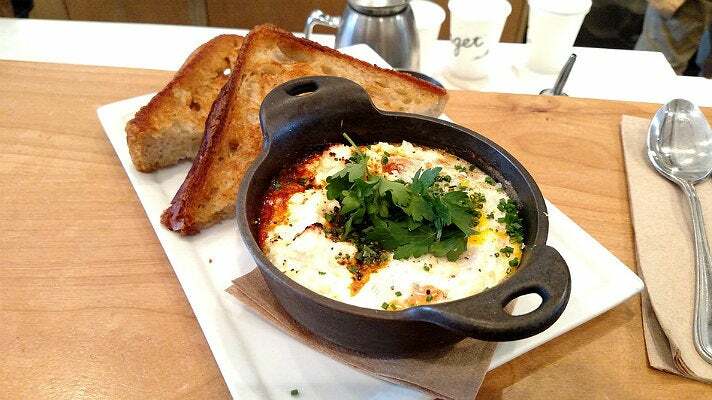 Read on to find out the best spots to get coffee, eggs, pancakes and more. 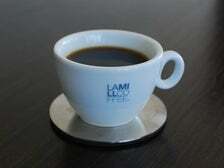 Not all coffees are created equal, but neither are all Alfred Coffee Houses. Head to Alfred in the Alley on the west side of La Cienega for access to freshly delivered breakfast sandwiches from Farmshop. They take a handful of minutes to warm up but they’re more than worth it, whether it be the Egg & Bacon, Egg & Ham or Egg & Spinach Biscuit Sandwich. But remember to get there before they’re all gone! 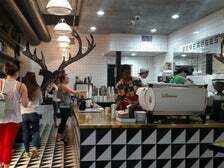 You’d never guess a coffee house as charming as this would be sitting in a plaza on the outskirts of Chinatown, but the naturally lit space boasts brews from a mix of different roasters. 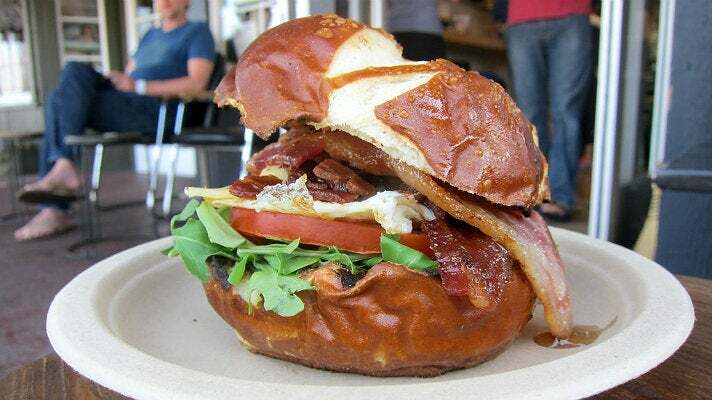 It’s a great place to try coffees you’ve never had before, but you’d be remiss if you didn’t also try one of their insane breakfast sandwiches (8:30 am – 1 p.m. weekdays, 9 a.m. – 5 p.m. weekends) by Royce Burke, known as The Rogue Chef. 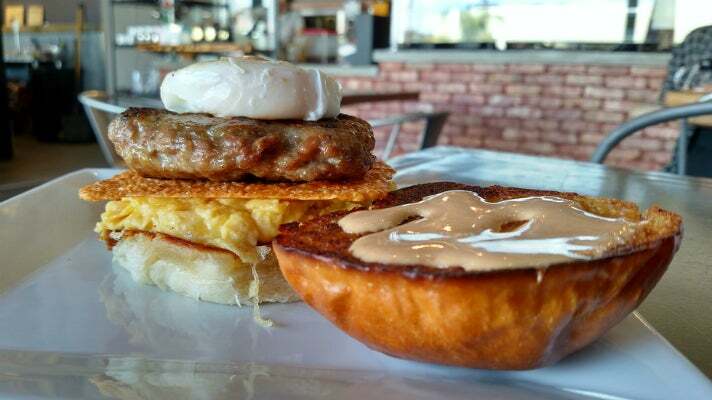 For instance, The Rogue puts black truffle pork sausage, scrambled and poached eggs, a cheddar crisp and sriracha-yuzu mayo between a toasted in-house milk bun. Far and away most known for their G&B coffee and indulgent espresso milkshakes, Go Get ‘em Tiger also has a breakfast menu (served 9 a.m. – 4 p.m.) that’s not to be missed. Whether you go sweet with their Churro Waffle or Ggettal Toast; or savory with Baked Eggs with chorizo, tomato stew and ricotta; it’s all delicious fare with which to sip your carefully curated coffee brew. 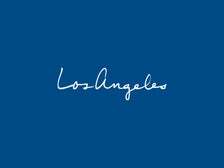 Enjoy everything within the confines of their high-ceilinged, cheery space in Larchmont Village. 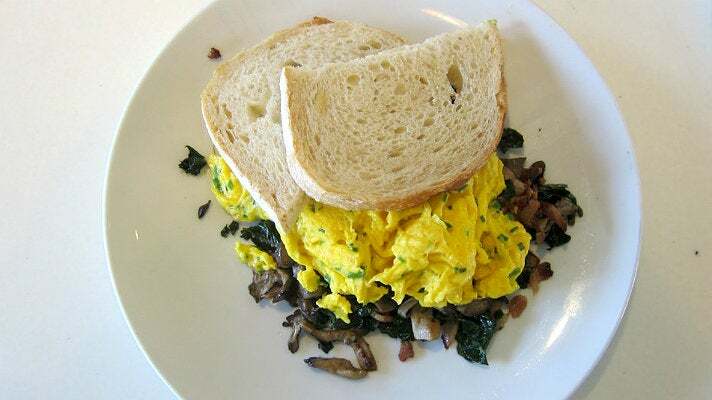 Habitat Coffee may be a new kid on the Glassell Park block, but they’ve got City Bean coffee and a handful of health-conscious breakfast options (7 a.m. – noon weekdays, 7 a.m. – 2 p.m. weekends) with slow scrambled eggs and your choice of ingredients taking center stage. 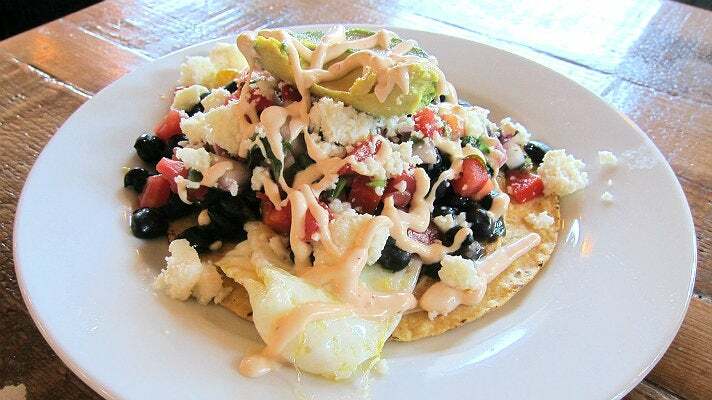 Made to order options include the Breakfast Tostada with 2 fried eggs, avocado, pico de gallo, black beans, sour cream and queso fresco. This Silver Lake coffee shop is as elegant as they come, with robin egg blue providing the backdrop for chandeliers and bright, plush and textured seating. 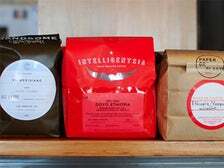 LA Mill’s beans are roasted in Alhambra, but the coffee shop serves as homebase of many high-end coffee and tea served in many of L.A.’s top restaurants. And here, they’ve got some fantastic breakfast offerings like omelettes and scrambles that are available until 3 p.m., so you can enjoy the most important meal of the day until the afternoon. Or, order the warm brioche donuts, which are available all day; that counts as breakfast, too. 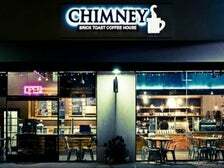 This fantastic neighborhood coffee shop is one of two passions for the Michelson family, with their adjacent dance studio in the back fulfilling their second. The two-story, beautifully designed Paper or Plastik brews Intelligentsia coffee all day and serves breakfast from 7 a.m – noon on weekdays and 7 a.m. – 2 p.m. on weekends. 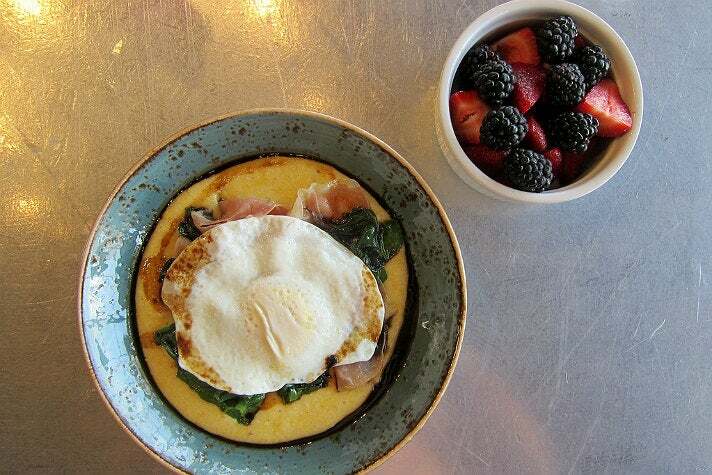 Try their Creamy Polenta Bowl or French Toast breakfast while reading a newspaper or using your laptop at one of the designated community spaces. 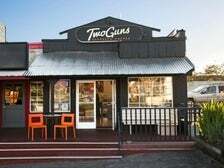 There’s some great coffee to be enjoyed in the South Bay, and the porch at Two Guns Espresso in Manhattan Beach would be just the place to do that, as well as enjoy some exemplary breakfast. Their house beans are roasted by none other than Caffe Luxxe, and what better way to enjoy them than by ordering a Flat White? Owner Andrew Stanisich hails from New Zealand and his passion for coffee shines through at Two Guns. 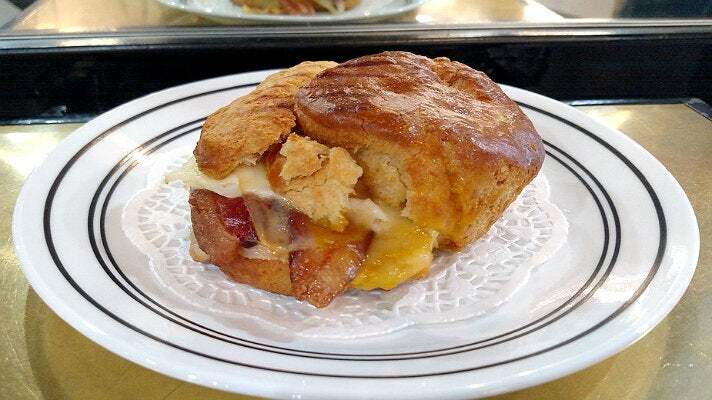 Order the impressive prezel bun Stan-wich (named for the owner), a Monte Cristo, or even the Ricotta-stuffed French Toast. It’s all excellent.